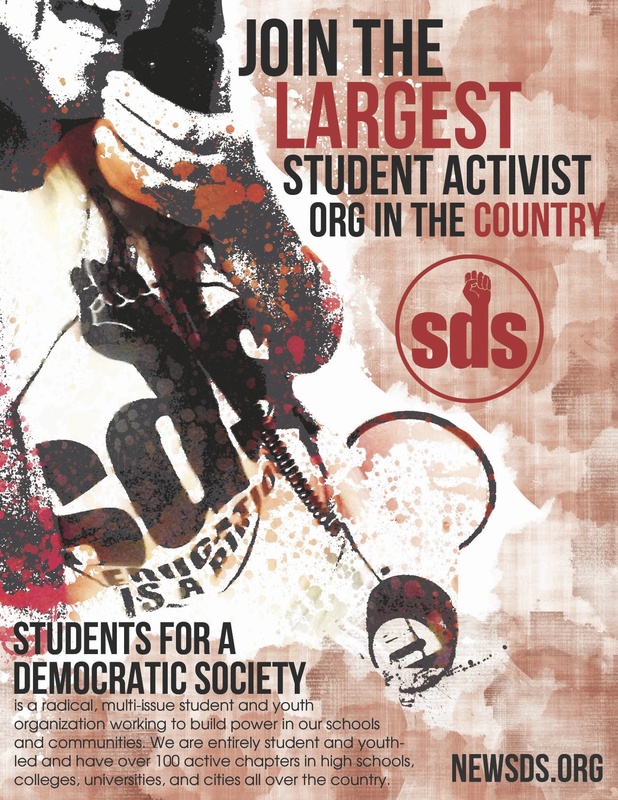 Students for a Democratic Society is strongly opposed to U.S. and U.N. Intervention in Libya. The absurdly named “Operation Odyssey Dawn” is nothing short of an open act of war against a sovereign state by former colonialist power with the aims of creating a stronghold over the trade of oil. This attack should also be clearly seen as a ruthless attempt to stop the revolutions and uprisings happening within the Arab world. At the beginning of “Operation Odyssey Dawn,” coalition forces fired about $62 Million worth of Tomahawk missiles at Libya. In a time where Detroit public schools are merging with the result that class sizes will approach 60 students, we in SDS wonder if that $62 Million could have been better spent. Libyans’ right to self-determination must be be upheld. Whether rebel forces or government forces will ultimately prevail is up to the Libyan people. While opinions vary on Libya and the role/power of the Qaddafi government, conscious people of the world must stand with civilians of Libya and say no to external military intervention of Libya. War and occupation is ongoing and has ravaged the livelihoods of the people of Iraq and Afghanistan. A new battle in Libya not only means more lives lost at the aims of procuring oil, but it also means social services here at home will be slashed. Our government should turn its focus into taking care of its own people rather than killing people in other countries. Naturally we in SDS have varying opinions as to the merits of the rebels and the government they are attempting to overthrow. That said, we are absolutely united in opposing external military intervention. We condemn any “military aid” to foreign countries. We demand money for human needs here at home! Libyans have the right to resist foreign military attack! Only the people of Libya can decide who will be in their government! On March 19, 2011, the U.S. government launched a third war in the Middle East. This time the target is Libya. The U.S. has launched over 100 cruise missiles at targets in Libya. This is not a “humanitarian intervention.” This is a war launched to try to control the oil resources of the region. The big powers intervene for their own economic interests, not for the interests of the people. This new war is costing billions of dollars. How many teachers could be hired for the cost of one cruise missile? How many families without housing could get affordable places to live? How many public employees could be paid to carry out needed services for the cost of this new war?We need funds for housing, jobs and education, not a new war! Speak out now to say NO to U.S. war in Libya! Initial endorsements include: Anti-War Committee, Emergency Committee to Stop U.S. War in Libya, Mayday Bookstore, Students for a Democratic Society (U of M), Twin Cities Peace Campaign, Women Against Military Madness. We are getting people of conscience together with our new Pledge to Resist FBI and Grand Jury Repression. When there are indictments or imprisonments, we are pledging to take immediate action against attacks on anti-war and international solidarity activists. 23 anti war and international solidarity activists have been subpoenaed to appear in front of a Grand Jury in Chicago, headed by U.S. Attorney Patrick Fitzgerald. They have done nothing wrong. They have educated and organized against U.S. wars around the world. And they have stood in solidarity with the peoples of Palestine and Colombia. All 23 of the targeted activists said that they will not cooperate with this witch hunt against the movements so many of us have worked to build. 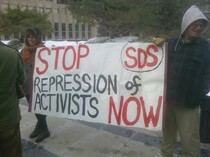 The U.S. attorney is working to put these activists in prison. Whether some of them indicted, or others are jailed for refusing to testify, the threat is very real. We will carry forward the fight for our right to speak out, organize and to stand in solitary with those who want freedom. We will stand up to any escalation of the attacks on anti-war and international solidarity activists. We will join the national day of protest when anti-war and international solidarity activists are ordered to appear in front of the Chicago Grand Jury or indicted. Anti-war and international solidarity activism is not a crime!